This week's Nail of the Week is gorgeous for summertime. 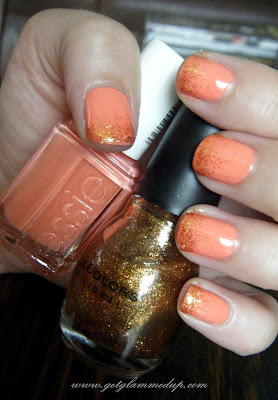 I used Essie's Tart Deco, which is a peach color that shows up more orange-y on. Then I did my glitter gradient technique using Sinful Color's All About You, which is a finely milled gold glitter. If you want to see a tutorial with only the glitter gradient, click here. You can find Essie's Tart Deco here, and Sinful Color's All About you here or at Walgreens.